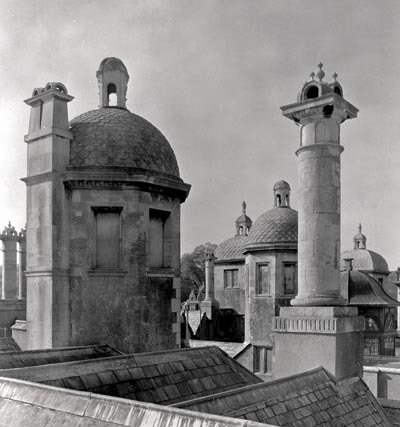 Vanbrugh was sensitive to medieval architectural forms, and it is no coincidence, therefore, that several of his houses possess striking chimneys. Here, at King’s Weston, Bristol, Somerset, they are linked by an arcade at roof level to create an additional decorative storey to the building. The roof commands splendid views. 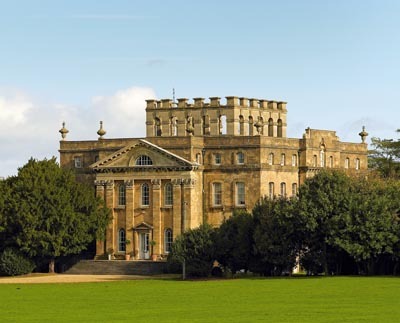 The chimneys at Thornbury in Gloucestershire, probably imitate those at Richmond Palace. This virtuosic triple-shafted example has miniaturised arrow loops and pinnacles. A scroll at the base is inscribed 1514. 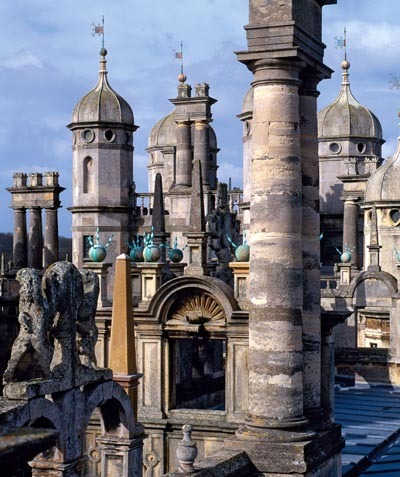 Longleat has an extraordinary late-16th-century roofscape punctuated by chimneys and banqueting houses. 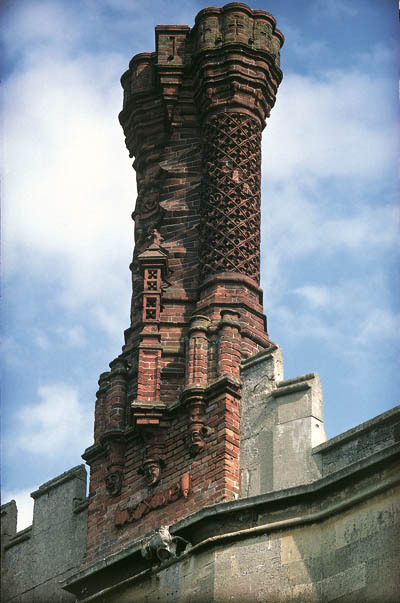 The English interest in using roofs for recreation was an important incentive for building appropriately magnificent chimneys. Old House in Hereford (formerly Butchers’ Hall) was built in 1612. 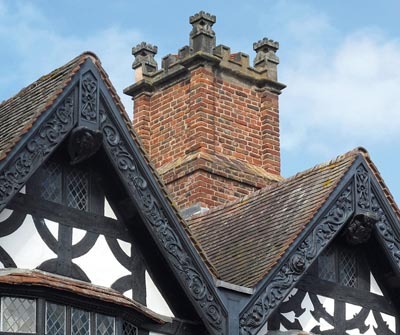 As is typical in timber-framed buildings, all the chimneys are gathered together for structural reasons into a single stack. Here, they take the culminating form of a miniature castle. 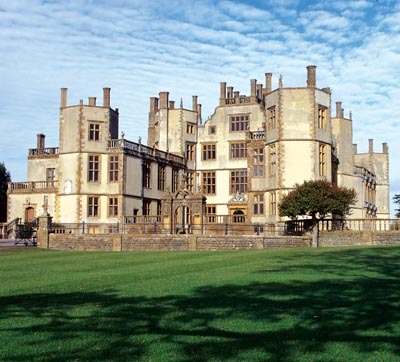 The chimneystacks of Newton Surmaville, Somerset, begun in 1612, create a visual framework for the house.  The top of each is surmounted by a detail inspired by grand West Country homes such as Longleat. On the leads at Burghley, begun in 1577, chimneys, domes and obelisks create a fantastical forest in architecture. The experience of walking amid these chimneys helps explain why the English were so long resistant to the high-pitched roof. 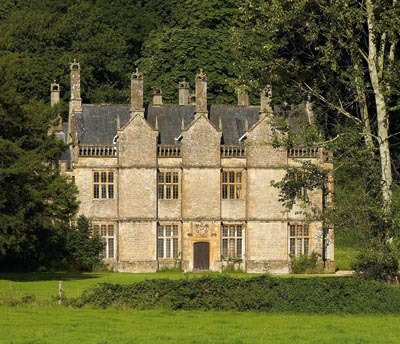 Sherborne Lodge or Castle in Dorset is crowned with an array of free-standing chimneys. Their counter-intuitive position on the angles of the building lends a curiously abstracted quality to the whole design. The lodge was begun in 1593, and extended with flanking wings that imitated the idiom of the original structure in the 1620s. 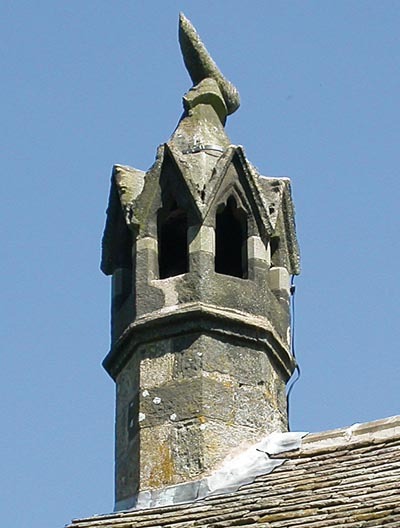 This re-erected chimney at St Briavels in Gloucestershire is probably late 13th century. The horn refers to the castle’s role as a hunting lodge. There are parallels for such imagery: crowns surmounted the chimneys of the royal apartments at Conwy in Wales.